You will be strutting your stuff if you win this Corral Boots Giveaway! This hot pair of boots retails for $250 and is part of the Spring Fashionista Giveaway Event where you can win $1,000’s in Fashion Prizes! Look like Miranda Lambert! Miranda Lambert’s favorite pair of boots are Corral Boots!!! Hosted by Still Blonde after all these YEARS and Modly Chic Co-Host: K Squared Glamour. All Fashion! Only FASHION event. 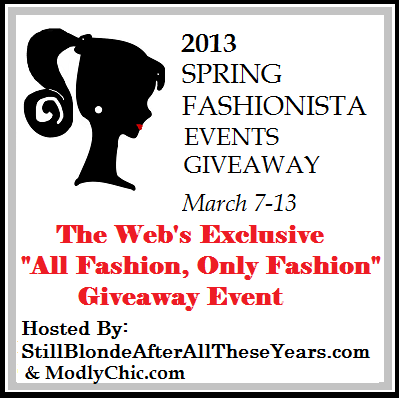 Largest Fashion Giveaway event on the internet with $26,000+ in prizes, 100+ participating blogs and 750,000 entries. Each individual blog has a minimum of $125 prize! 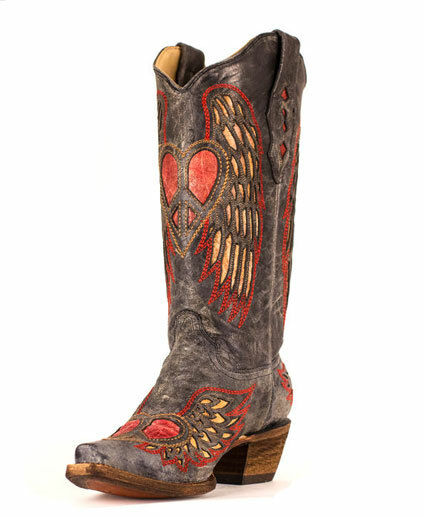 One lucky winner will walk away in the Corral Ladies Fancy Inlay Western Boot in winner’s selected size. They have an Antique Black Foot with fancy inlaid wing and heart. They have a 13 inch black antique top wi featuring a cushion insole for all day comfort. 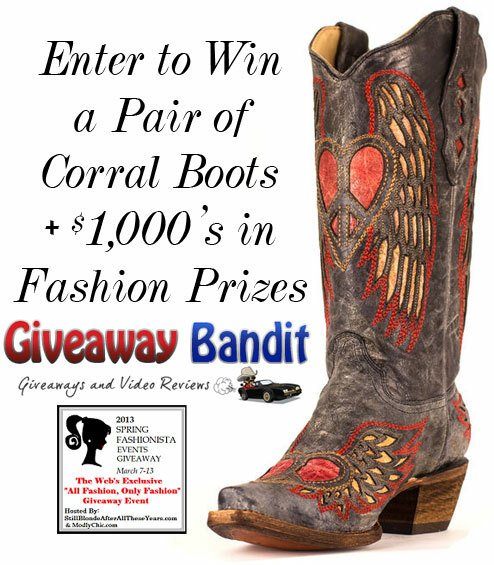 Enter to win the Corral Boots Giveaway below! Enter to win via the giveaway form below. Giveaway ends March 13 at 11:59 pm EST. Giveaway is open to US and Canada, 18 years and older. Be sure to go to the enter to win $1,000’s more in fashion prizes by clicking on the blogs below the entry form. Good luck everyone! Giveaway Bandit contains endorsements for products and services, which means when you click on a link that I recommend, I may receive a commission. Not every link is an affiliate link. Giveaway Bandit received one or more of the products mentioned above for free for evaluation purposes and is an affilate of one or more of the products and banners you will see on this site. Regardless, all opinions expressed are still 100% my own. I am disclosing this in accordance with the Federal Trade Commissions 10 CFR, 255 Guides Concerning the Use of Endorsements and Testimonials In Advertising. Giveaway Bandit Disclosure. Still Blonde after all these YEARS , Fashionista Giveaway Events or the Fashionista Giveaway Event bloggers are not responsible for sponsors that do not fulfill their prizes. I like that nail polish goes lighter in the spring. i love spring time because then i can break out my dresses/sundresses/skirts and sandals!!! I love that spring incorporates lighter colors and flowers. I love clothes from Le Chateau. There spring line this year is wonderful! I am going to buy some pieces in Orange and the new Green colors this year. I am going to buy some pieces in the new Orange and Green colors this spring! I love the ladies turquoise blue cortez cleff embroidery R1973 too! I can’t wait to wear sundresses and am hoping the Maxi dress is still in! I love Kate Spade and I love all the really bright colors that are in this spring! Lovin’ the new pastel nail polish trends! And color-blocking! I’m big on fashionable workout gear! LuluLemon and MPG are my top faves! I love the bright, happy colors of spring trends and think it looks super cute when boots are paired with long flowing skirts. I like just being able to get out of all that bulky clothing from winter – into a tshirt and jeans and flipflops. Skirts too. I like the livelier, brighter clothing color in Springtime. I love spring colors! That is my favorite thing about spring fashion! I like the pretty colors that are coming back again..
don’t know if my comment went through my computer died! I love long spring/summer dresses. i love neutrals head to toe! I love linen pieces for spring. I love wearing scarves!! It is such an easy and cheap way to accessorize!! I love the yellows that are available now. i love all the bright colors everyone is using…tired of dark winter colors! I love corals and emerald green. I love turquoise and anything coral. Hoping to get out of the brown/black phase I have somehow managed to get into. This spring I’m hoping for bright colors and wild print! have a granddaughjter who love boot . I really love the bright colors they have for Spring. The pallet is just exquisite! I’m obsessed with Forever 21! My daughter loves these boots, fingers crossed on being a winner! I am loving the Coach handbags for Spring….plus the Emerald Green and Sapphire Blue colors. Love skirts and Michael Kors!! I love Tea Collection – mostly for kids clothes, but their women’s clothes are pretty too! I love the chance to be able to wear nice bright colors! I love the plentiful florals and jewel-tone colors! Commenting on the Pretzel Crisps® Flavors Review! They are great to serve with artichoke-spinach dip! Spring means Sun dresses and cowboy boots! about the only ‘spring fashion’ i am up to speed with is short pants and flop flops. I love VS which has cute swimsuits for summer… and flip flops but also workout clothing! I love Michael Kors and pastels in Spring. I love Rachel Pally,s clothing.Thanks and happy easter. I love the spring colors that imitate the spring flowers like yellow, spring green and lilac. I love light airy scaves for spring and I’m digging nine west boots and handbags. Thanks for a great giveaway! I love when it gets warm enough to wear jeans, tees, and SANDALS!!! I love to add pops of tourquoise in with darker bold colors & bright flowery scarves to welcome Spring! I love Izak Mizrahi’s line too! I love Bloggers that sponsor great contests! I love preppy/nautical fashion for spring and my favorite place to get clothes is j crew! I like cute dresses with tall cowboy boots and jean jackets. Thank you! I love necklaces and purses!! Love the new bright floral prints! I’m a guy so I’m not all that fashionable but I do really like Arizona Jeans. I love the pastels of Springs with a light/faded denim. I love the mint green paired with coral. I’m also loving the color of the year, green. My fav. I love the spring colors for this year! Soft and pretty! My favorite fashion brand is Coach. I love being able to throw off all of my dark sweaters and finally dig the pastels in cotton and silk out! Won’t let me leave a comment…says I’ve already left a dup comment even though I haven’t left anything????? I liike that Spring means getting highlights in my hair, I also love boot cut Lee jeans and my fav. fashion item are an awesome pair of sunglasses! I’d love to have something floral from anthropologie!